The speedy ZenWheels Remote Control Microcar is fully controllable via any compatible Apple iOS or Android device. 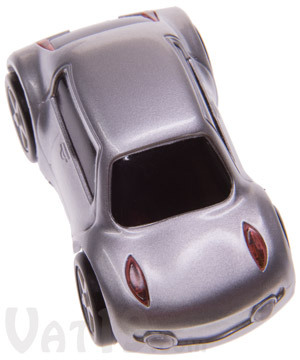 At only 2.25" long, this miniature racer is the perfect tabletop toy. And with its included plastic carrying case, you can take your ZenWheels Microcar anywhere and race it with your iPhone, iPod, iPad, or Android device. 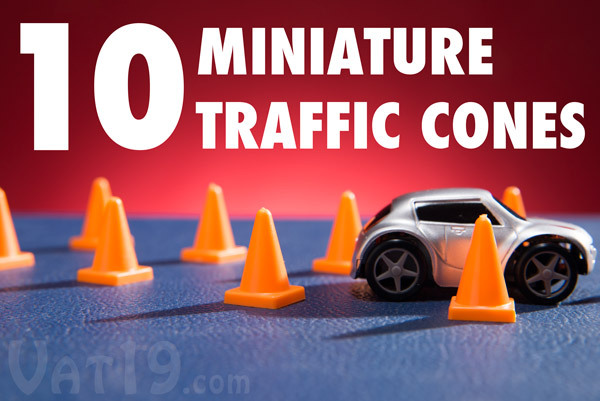 Zip around the salt and pepper shakers on the kitchen table or construct an obstacle course using the ten included miniature traffic cones. You can even record your lap times using the supplied timing gate. ZenWheels R/C Microcars are available in two colors: white and silver. Dimensions: 2.25" x 1.25" x 1.0"
0:18 - ZenWheels is now compatible with Android devices! 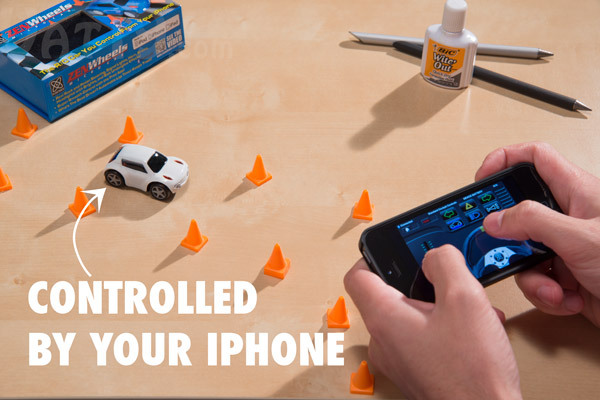 Remote-controlled microcar for iPhone, iPod, iPad, and Android! Zip around your desk, kitchen table, bench, countertop, buffet, or pool table with a ZenWheels R/C Microcar. 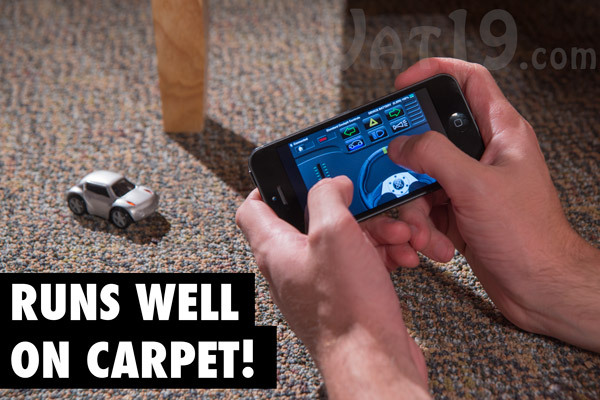 These tiny, remote-controlled cars are wirelessly controllable via your iPhone, iPad, iPod, or Android device. Employing Bluetooth technology ensures a long range, precise control, and zero interference with other ZenWheels cars. The miniature ZenWheels R/C Microcar is fully controllable via your iOS or Android device. Generally speaking, our rule of thumb at Vat19 is to do it jumbo. However, remote-controlled vehicles are the exceptions that prove the rule. The ZenWheels Microcar is a mere 2.25" long but can zip along crazy fast. Plus, jumbo cars already exist. They're called conversion vans and they cannot be improved upon. At less than 2.5 inches long, the ZenWheels Microcar is perfect for racing around small tables. Cool lights, signals, and sirens! The ZenWheels Microcar does more than just fly around superfast. It's got manners (in the form of turn signals and headlights) and ridiculousness (in the form of ground effects and police sirens). 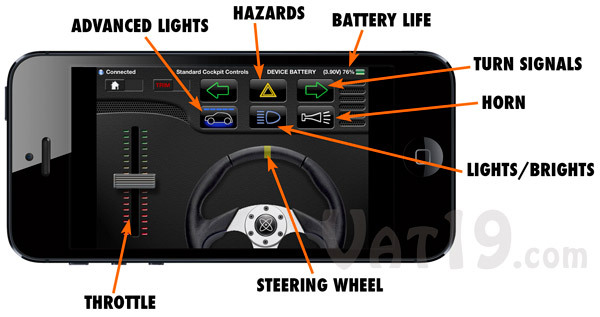 Use the included iOS or Android app to activate the turn signals, hazards, head lamps, brights, ground effects, and emergency vehicle sirens. Check it out in the demo video below. The ZenWheels R/C Microcar features incredibly precise control via its app. Create a "parking space" out of matchboxes only 3 inches long, and you can parallel park this sucker — no scratches, y'all! Or better yet, create high speed race courses using the 10 included mini traffic cones and test your "Fast and Furious 8: Tokyo Drift 2"-style skills. Side note: The proceeding Fast and Furious joke will still be funny when they actually create said 15th sequel. A set of 10 orange cones is included with each ZenWheels Microcar. Once you've purchased your ZenWheels Microcar, simply download the free app from the Apple App Store or Google Play, and you'll be racing in minutes. The intuitive interface makes driving simple. Place one thumb on the throttle and the other on the wheel, and you're off. Tap any of the six control buttons at the top to activate turn signals, headlights, ground effects, and even honk the car's horn. An additional indicator lets you know how much battery life is remaining in your car. Control your ZenWheels Microcar with the free app. One of the coolest features of the ZenWheels R/C Microcar is the timing gate. Place it anywhere on your course and each time your car drives over it, a signal will be sent to your iOS or Android device. This allows the app to keep track of your lap times. Pretty dang sweet. 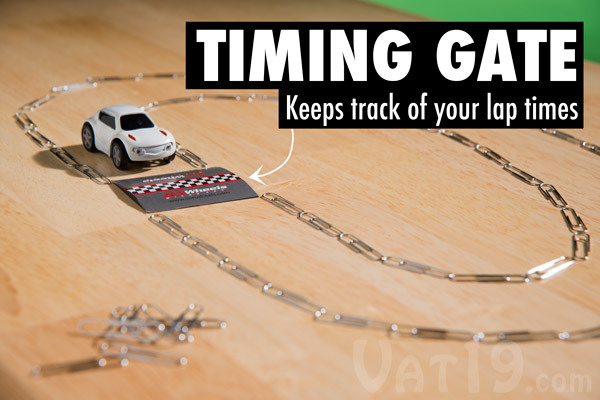 The included timing gate allows you to monitor your speed around the track. The ZenWheels Remote Controlled Microcar is powered via a rechargeable battery. It provides over 20 minutes of race time per charge and is easily recharged. Simply plug the included USB cable into a wall charger or powered USB port on a computer. It only takes about 30-40 minutes to fully recharge. 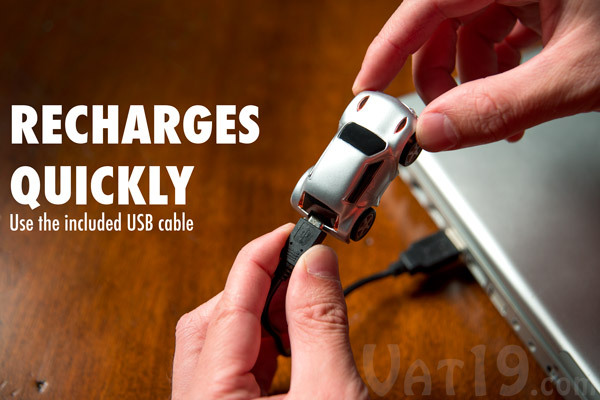 Recharge the car's battery via the included USB charging cable. Carpets are no problem for the ZenWheels Microcar. Well, let's clarify. The shag carpeting in your grand parents' dining room probably won't work too well. But, provided that your rug can't be mistaken for an overgrown lawn in need of a mow, you should be fine. The ZenWheels Microcar can effortlessly streak across (non shag) carpeting. 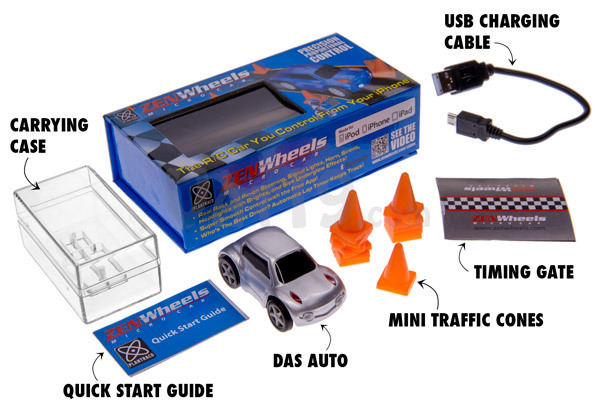 The ZenWheels Microcar comes equipped with the following items: a plastic carrying case, a quick start guide, a bevy of miniature traffic cones, a timing gate, and a USB charging cable. 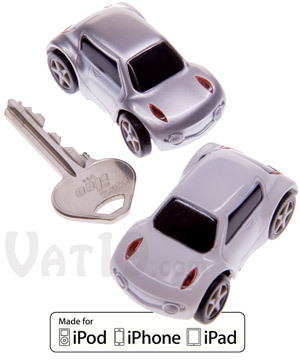 The ZenWheels Microcar is currently available in two colors: silver and white. Get both. It'll make it easier to tell who is destroying whom during your epic recreations of The Cannonball Run. ZenWheels Microcars are available in two styles: silver and white. Answer: On a full charge, the ZenWheels Microcar will provide 20+ minutes of race time. The battery is rechargeable via the included USB cable. It only takes about 30-40 minutes to fully recharge. Keep in mind that the battery's voltage is displayed in the app and that the battery can be charged at any time. There are zero memory effects with this type of battery. Question: Does it work with Android? Answer: Yes! Not only does it work with iPhones, iPods, and iPads (iOS 3.2 or later), but also works with the free Android app via the Google Play store. Question: Does it have tilt controls? Answer: Yes! If you don't like using your thumbs for throttle and steering, there are additional control methods available. You can tilt your device to control steering as well as throttle. There is even a dual joystick control method for self-described RC freaks. Question: If my cat eats it, is that bad? Answer: This speedster will present quite the challenge to any domesticated jungle cat. However, should your cat catch it, I'm sure it's smart enough to realize it isn't food. Question: Why is it expensive? Answer: Because it's a true miniature RC car! Unlike other similar toys, ZenWheels have 1:1 turning, speed, and other operations (lights and sirens). Other cheaper toys can only have two speeds, off and fast, and can only make hard turns.